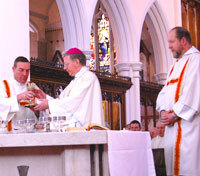 Bishop Séamus' Pastoral Letter talks about the role of a Deacon and the importance it plays within our Diocese. 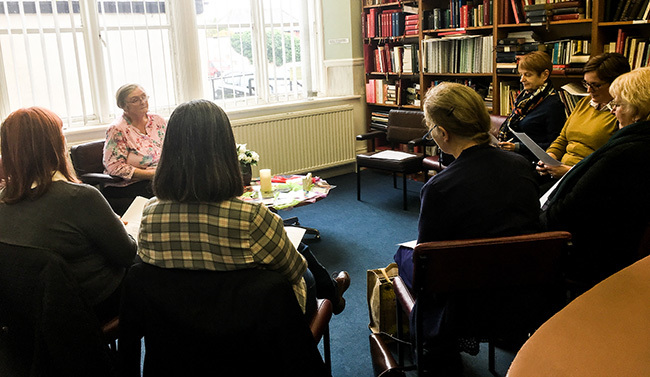 On Saturday 13 October a group of Diaconate Wives spent a quiet day with Sr. Sheila McNamara at St Hilda’s Pastoral Centre. This is an annual event which offers time together to wives of Deacons. Time out, space, time to share with others, meet others, support others and a time to reflect on their own Spirituality. It is also another opportunity to welcome new wives and support them on their journey. Pat Kennedy MPS Diaconate Formation Team. In the early church, deacons were very important. The Second Vatican Council saw the need to restore the Permanent Diaconate which is open to married men, and most dioceses throughout the world have begun to accept this need. 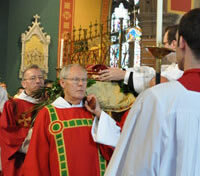 Increasingly, deacons are becoming involved in various ministries throughout our diocese. Some are involved in paid ministry such as hospital chaplaincy or lecturing, several are involved in various diocesan commissions and associations such as Marriage and Family Life, Vocations, Diaconate Formation and Marriage Tribunals. 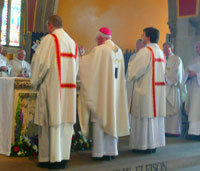 All are involved in their local parish and community, some with added responsibility where there is no resident priest. Deacons are unpaid, most in Hexham and Newcastle Diocese are married men and their wives play an important part in the formation and ministry of deacons. The deacons are from a wide range of professional and educational backgrounds and together they form a diaconal community to support each other in their spiritual and ministerial lives. A deacon receives the sacrament of Holy Orders and is an ordained minister within the Roman Catholic Church. The clerical dress of a deacon is similar to that of a priest but the ministry of a deacon should not be confused with that of a priest. Deacons are ordained to serve the Church in a threefold ministry. The deacon will proclaim the Gospel and sometimes preach at Mass and other religious services. He will preside at services other than the Mass and he will lead the people in prayer. He will also officiate at funeral and burial services. The deacon has a special ministry during Mass and he will assist the bishop or priest who is presiding. He will distribute Holy Communion at Mass, in hospital and in the homes of the sick, the housebound and the dying. The deacon will baptise and help to prepare people for this sacramental celebration. He will also prepare people for the Sacrament of Marriage and he may officiate at their wedding.